A first visit to our office usually includes completion of initial paperwork, followed by a detailed and thorough discussion of your health history with one of our doctors. Next you will receive a chiropractic examination, a posture exam, and lastly you will receive a scan of your nervous system with our “Subluxation Station.” This scan takes only a few minutes, but is paramount in telling us how your nervous system is functioning! 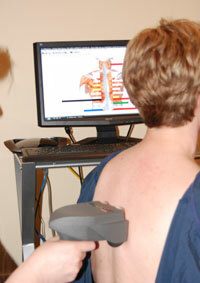 The scan consists of an EMG and Thermal Scan, as well as a Heart Rate Variability analyzer. These tests are completely safe, non-invasive and painless. If you have x-rays or MRI/CT reports, please bring them along. If you have not had any of these tests, and we deem them necessary following your initial examination, we will make a recommendation to you and your family doctor. Adjustments are usually not given on the first visit. A review of your history and examination results are necessary to make the best recommendations and ensure you are given the best care. Your first adjustment will be given on your second visit, which is usually scheduled for 1-2 days following your first visit. The entire first visit usually lasts between 45-60 minutes. We ask you to please be prompt for your appointment time. This allows us to keep on schedule and be respectful of all practice members. It is very important that you have watched the 7-minute video “The Big Idea” before you arrive at our office for your first visit. It succinctly describes why and how chiropractic care can help transform your overall level of health and wellbeing. To learn more about your second visit, click HERE.